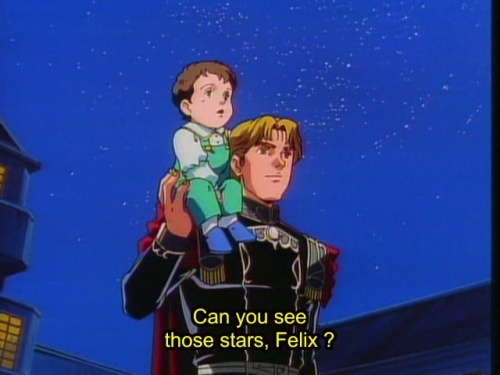 During the very last scene of Legend of the Galactic Heroes, baby Felix gazes up at the night sky and grasps at the stars. “That might be an action that’s been repeated endlessly in any era, in any world,” the narrator poetically explains, adding that “Humans always pursue things that they can’t reach”, yet the knowing expression on Mittermeyer’s face is almost heart-breaking, “Felix, you too…?” This is, perhaps, the most emotional moment of the entire series, expressing everything that there is to love about Legend of the Galactic Heroes in a matter of seconds. Alas, that isn’t enough. There is still so much more to say, so much more to explore. Hoping that more people may discover this fine series, and, perhaps, to dip myself into this story for one last time, I have carefully composed this (chronological) list of highlights from the series, but be warned, it contains massive spoilers. As the Goldenbaum imperial court looks on with heartless disdain, the screaming Marquise Benemunde is restrained by the Emperor’s guard and forced to drink from a glass of deadly poison. Her bitter end was the result of her desperation to reclaim the love of the Emperor, which she had lost forever to the beautiful (and much younger) Annerose, Reinhard’s beloved older sister. The sheer indignity of this scene, combined with the casual formality of the court’s impeccably dressed on-lookers, is so pointlessly cruel and chillingly orchestrated that one is left in little doubt as to the morality lurking within the aging Goldenbaum ranks. 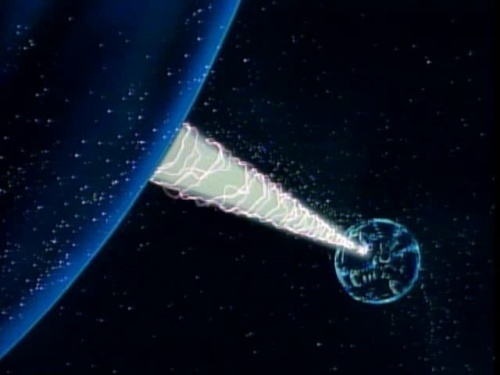 Due to a small rebel uprising, Prince Braunschweig launches a massive nuclear strike at planet Westerland, intending to incinerate millions of innocent people. 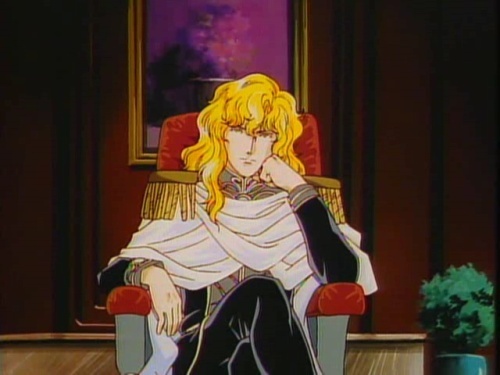 Reinhard’s immediate response is to intercept it, but his war-time adviser, Oberstein, suggests that he should just let it happen, as the public’s reaction to such an atrocity will swing the empire’s popular support in Reinhard’s favor, exposing the Prince and his allies as irredeemable villains. Reluctantly, Reinhard agrees and Westerland is decimated. Millions die as a means to an end. This is the kind of political versus moral quandary that has no right answer. If Reinhard had stopped the strike, he could be dragged into a war of attrition which could claim millions of soldiers over a period of months (and even years, perhaps), but by allowing it, his rise to power is swift, albeit, forever tainted with the blood of Westerland. Neither is an easy choice to make, and for exactly that reason, we have a thrilling tÃƒÂªte ÃƒÂ tÃƒÂªte between leaders, who, very literally, can forsake or save the lives of millions with one word. One of most shocking moments in Legend of the Galactic Heroes is the sudden death of Siegfried Kircheis, Reinhard’s dearest (and perhaps, only) friend. Up until this moment, he was one of the main characters, an uncommonly benevolent military commander who had spent his childhood with Reinhard. They dreamt of a better future together and were devoted to toppling the corrupt Goldenbaum dynasty, so his demise is tragic and ill-timed. He is killed by Prince Braunschweig’s chief retainer, Ansbach, who pulls a giant weapon from within the Prince’s dead body but misses his main target, Reinhard. Kircheis tries to restrain Ansbach and is mortally wounded by the assassin’s then-concealed laser ring. Within minutes, he has bled to death. A stunned Reinhard is unable to accept what has just happened, and it scars him for life, as well as delivering a massive blow to his sister, Annerose, who had been secretly in-love with Kircheis this whole time. It’s a moment that Reinhard regrets for the rest of his life and drastically alters the complexion of the story. There is something innately thrilling within the sheer spectacle of seeing two planet-sized, Death Star-esque fortresses, Geiersburg and Iserlohn, do battle. Credit is due for the audacious imagination required to even consider moving Geiersburg within seeing-distance of Iserlohn, while the battle itself is gob-smacking. Between the tomahawk-wielding Rosen-Ritter skiing across Iserlohn’s liquid surface, ripping apart Imperial soldiers as they do, and tactician Yang Wen-li’s brilliant trump card, leading to the destruction of Geiersburg via Iserlohn’s lightning strike, a.k.a Thor hammer, one can only conclude that this is epic anime, and it is awesome. Just think, this is what Star Wars could have been. The defining moment between Reinhard’s Imperial rise and Yang Wen-li’s democratic Alliance is in the Battle of Vermillion. Having blasted his way though line after line of Imperial defenses, Yang’s fleet has finally trapped Reinhard’s ship, the Brunhilde, but at this most critical of moments, Yang receives an order from his superiors (millions of miles away on his home planet of Heinessen) to surrender and, to the horror of many, he calmly acquiesces. Thus, despite everything that he (and his Alliance) stands to gain from killing Reinhard, he won’t allow his command to override his government’s order. Walter Von Schenkopp urges him to fire and think later, to consider the history of the universe, Yang could even pretend to not have received the message in time, but he steadfastly refuses because to create such a precedent in history would forever undermine the strength of democracy in the future. Hence, many more lives are lost because Reinhard survives, but Yang’s loyalty to his political system is admirable. He isn’t at fault; it’s just bad luck that his government happens to be incompetent. At the Battle of Marr-Adetta, Old Admiral Bucock meets his maker. Battle-weary, yet too old to do anything but fight, he evacuates his remaining soldiers before rejecting Reinhard’s offer of mercy, instead choosing to go down with his ship. His final speech to Reinhard blazes with the kind-of respect and pride one can only feel for a man who has seen it all. 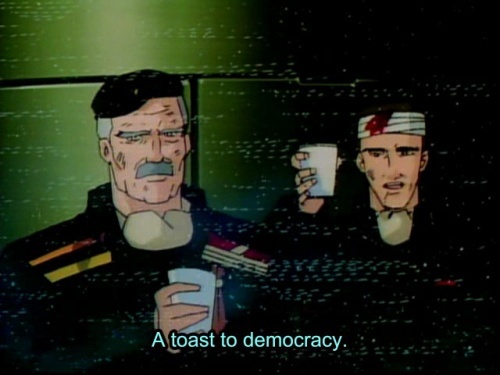 He closes with a toast to democracy, composed as he tastes the last wine of his life, completely and utterly unshakable in his belief. It is a brave man’s end. For such an influential person, the irony of Miracle Yang’s death is that it’s not glamorous in the slightest. His luck merely runs out, as, having been shot through the leg by an unnamed terrorist, he bleeds to death in some dark corridor, alone. This is such a tragic and lonely way to die, but even still, his last words are an apology; all this time he has carried guilt for every life lost under his command. His departure affects friends and enemies alike. 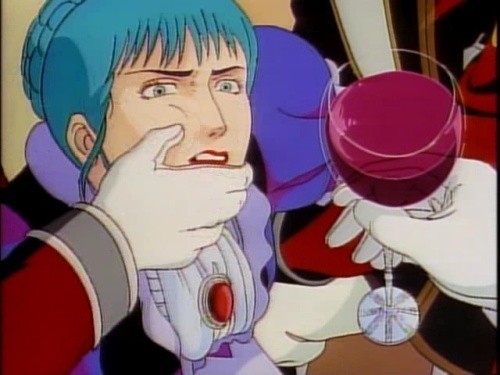 Reinhard loses his last reason to fight and decides to retreat from battle, while Julian Minci, Yang’s dearest student, flies into a bloody rage before eventually helping to establish the Iserlohn Republic Government, leading their military in The Magician’s shadow. Yang Wen-li’s presence constituted one half this story, his life, his love and his brilliance is documented through out the first three seasons and, like Kircheis’ sudden death, his shocking exit monumentally shifts the tone and direction of Legend of the Galactic Heroes. In the words of his best friend, Wolfgang Mittermeyer, Oskar von Reuenthal was “drunk with blood-colored dreams”. Somewhat carelessly, he rebels against Reinhard as if it was always his destiny, the very purpose of his life, but he loses the battle and dies. Reuenthal was born with a rare eye condition called heterochromia iridum (both eyes are a different colour), which was used as proof that his mother was an adulterer. She committed suicide, but not before attempting to violently gauge out one of her son’s eyes! His father started drinking and blamed the young boy for everything that had transpired. Reuenthal never escaped this past and developed a taste for self-loathing; particularly strange was his relationship with Elfriede von Kohlrausch, who superficially hated him, despite carrying his child. His rebellion, and ultimately, his death, were all linked to this sad story. Reuenthal always wanted to be loathed, to be the villain. Many great characters die in this final battle, Merkatz and Schenkopp amongst them. They sacrifice everything to create such a tiny opportunity for Julian to meet with Kaiser Reinhard face to face. Overwhelmingly, this feels like a battle of despair and hopelessness, with an almost suicidal agenda, every passing minute heaping on yet more death and grief, but finally, his moment arrives. Julian staggers forth into Reinhard’s quarters, barely able to stand from fatigue, covered with the blood of dear friends and hated enemies alike. And then they talk. This is a scene of quiet wonder. 10. Reinhard’s death; a sword has no reason to exist but as a sword? 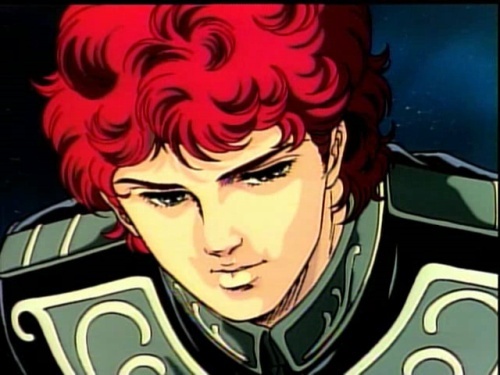 Reinhard von Lohengramm is the Edmond Dantes of Legend of the Galactic Heroes, a peerless avenger and prideful leader of men. He dies from a terminal illness, just two years into his reign as Kaiser, aged 25, said to have burnt away his life to fight. The end of his life marks the end of this great story. Joined at his death bed by his beloved sister Annerose, she whispers “You haven’t had your fill of dreams, Reinhard?” “No,” he replies, “I had plenty that no one had ever seen before.” One can’t help but wonder, what could they possibly contain? Reinhard’s greatness lies in the guilt he feels over Westerland, the regret that marks his every move after the death of his dearest friend, Kircheis, and the loneliness and vulnerability that eventually sweeps him into the arms of Hilda Mariendorf, with all the delightful romantic naivety that follows. He is a great character and, more importantly, a likable person. Bravo. Reading this was like experiencing some small part of the story again. I had to break out the fourth movement of DvoÃ…â„¢ÃƒÂ¡k’s Symphony No. 9 just to accompany your post. It strikes me that the choice Reinhard faces when Westerland is attacked with nuclear weapons – a potentially huge death-toll in a war of attrition or a comparitively small but actual death-toll from a nuclear strike – is similar to the choice faced when the atomic bomb was first used, as it’s presented in popular history at least. I haven’t read up on it, so I don’t know the facts of the matter. Bucock’s was one of the most affecting deaths in the story for me. It’s brilliant that he puts democracy’s advantages in such a human way – a matter of friendship – rather than dressing them up in ideological language about freedom, and if any appeal could have reached Reinhard I’m sure it would have been one couched in Bucock’s terms. I also remember the scene some episodes before in which Bucock realises that he will be called up again, and his wife brings him his uniform without a word (if I recall correctly). I’m not sure she was even named, but that struck me as a heroic sacrifice on her part nevertheless. Wow! Thanks for the fantastic write-up. And way to make me cry on the first day of the new year. ^^;; That “you too, Felix?” never fails to break my heart. 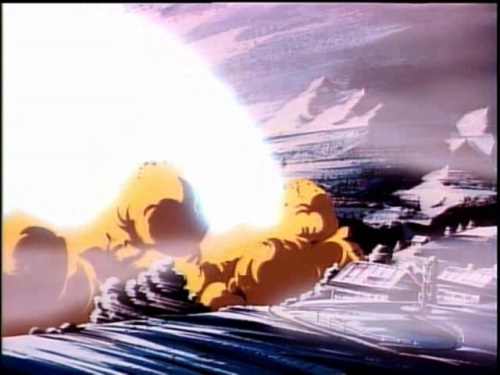 As for the Westerland incident, I think what makes the situation even more tragic is that Reinhard doesn’t really agree to let Braunschweig nuke Westerland – yes, he vaguely agrees but decides to wait till the last moment, and eventually misses the opportunity to really decide (due to some “help” by Oberstein). I always felt that his indecisiveness over such a crucial issue wounded him more than he let on, especially that it indirectly led to Kircheis’ death. Reuenthal’s was the one that death affected me the most in the story, and I think he’s one of the most complex characters. I don’t think his rebellion was careless in the least. 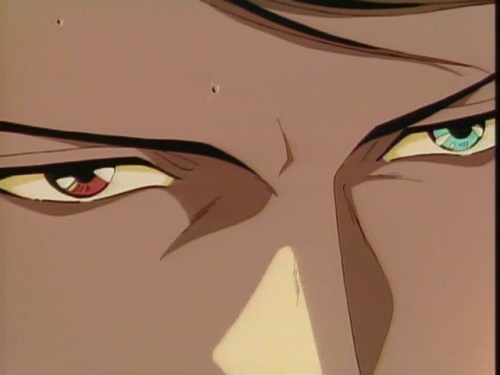 The seeds of his rebellion were sown right after Kircheis’ death, when Reinhard challenged him to rebel against him. In hindsight there were signs throughout the story – sometimes we can see Reuenthal watching Reinhard like a hawk, and as the story advances we see him spiraling deeper and deeper until he reaches the point of no return. I think it’s mostly due to Mittermeier that he lasted this long at all. I think that aside of his characteristic self-hatred, Reuenthal’s main problem is that he’s a truly brilliant man overshadowed by Reinhard’s charisma and sheer genius. Someone mentioned that his greatest tragedy was that he and Reinhard were born in the same period. I think if Reinhard hadn’t existed he would’ve taken on the same role (though obviously in a different way). However, as it is, he’s fated to play second fiddle, and to make it even worse, he honestly admires Reinhard. Yet his ambition and pride compels him to take on Reinhard’s challenge when he sees him as “weak,” even though he knows he’s doomed to fail. Also, I think unconsciously he may have realized that neither he nor Reinhard are cut out for peacetimes (Reinhard even says at one point that he needs enemies, someone he can fight against). As I see, his rebellion was, in the end, an elaborately set-up suicide. By the way, as for Reinhard’s last words, I wonder if there’s a translation mistake in the sentence you quote or I just misunderstand it (it’s past midnight here and my reading comprehension tends to fail at this time) – in Japanese he says he’s seen more than enough (‘mou juubun ni mimashita … juubunsugiru hodo’). Nice, and great screencaps. And listening to the final movement of Mahler’s 2nd (coincidentally, the first movement is the first BGM song played in the anime) will really bring on those manly tears. It’s odd, I wasn’t affected much by Kircheis’ death. I was more interested in the awesome ZJWOOM sound the fire-launching gun that was used to attempt to assassinate Reinhard made. I’d agree that Bucock’s final go at the Empire was one of the most awesome parts ever. Truly epic. @IKnight – ahhhh yesss, Bucock’s wife’s wordless understanding was amazing. @Martin – Cool. LOGH is like an otaku’s rite of passage. After you reach a certain point in your anime fandom, it’s hard to ignore. @IKnight – There’s so much more I wanted to mention. The little things, like Bucock’s wife, how Oberstein betrayed his cold image by so clearly loving his dog, and the way everyone collapses into sleep after the Battle of the Corridor, sleeping in elevators and on the floors, etc. All these little details, they add so much personality to the story. To be honest, I totally missed the Westerland/Hiroshima subtext, but it’s obvious now. One can’t help but wonder; had those bombs not been used in 1945, would the world have enjoyed such (relatively) peaceful times since? I mean, all-out war seems to have been avoided since then, mostly under the pretext that a nuclear conflict would spell destruction for mankind. 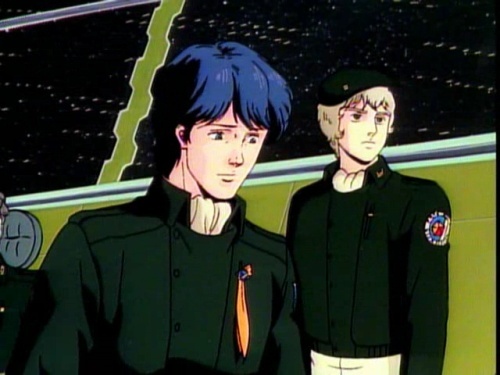 Anyway, it’s been a pleasure blogging LOGH alongside you and the other guys, so I’m glad this article kindled some nostalgia within you. @kuromitsu – Ah, such a lovely comment. Thanks, kuromitsu. … To me, this implies that Reinhard had ambitions for the future, outside of military conquest, a lost chance at happiness, which is reflected in Annerose’s distraught expression. She realises that her brother was never just a ‘sword’, and that he has died for her happiness, which is extremely tragic. I hope the translatation is correct, because it’s a beautiful sentiment. I think Reuenthal is the most complex character in the story, with the possible exception of Oberstein, and I agree with a lot of what you say about him, in particular, that sense of being torn in two different directions. His personality is ambitious and cut-throat (which is noted by Oberstein, years before the rebellion), yet, he so clearly admires Reinhard too. So, while that temptation for suicide definitely plays a part in his ultimate decision to rebel (and explains his odd relationship with Elfriede; she won’t kill him because she knows that is exactly what he wants from her), his loyality to Reinhard may have something to do with it too? He rebels because he knows Reinhard needs an enemy? Ah, what an enigmatic man. In hindsight, may be ‘careless’ was the wrong word to use after all, may be ‘nonchalent’ is better. It’s difficult, trying to describe the thought process of such a calm and collected character. @lelangir – Oh, you should write a list. After all, the more people we can make aware of this series, the better. LOGH will never be licensed, so it’s just a case of hoping others will discover it via word of mouth. Awesome screencap. You pretty much highlighted the important parts of the series. To me, though, the most important part would have to be Siegfried’s death. Not only did it snap me out of the idea that important characters would have a bullet shield around them, it also shifted the tone of the series for EVERYONE. During Reinhard’s rise, the absence of Siegfried is clearly noted by every important admiral and leader-figure, including Yang, as a tempering and calming voice of reason. During Reinhard’s rule, just the same goes on, and this time it’s not Siegfried’s presence as a calming mediator, but more-so his role as Reinhard’s sheathe, the idea here being that if only Siegfried had lived on, Reinhard would not have died in so… pathetic a manner as he did. Siegfried’s greatness lies not in his outstanding military talent or devotion, but in his compassion. It’s this compassion and love of life that gives him an understanding of it that somewhat transcends the minds of pretty much every other LoGH character, except possibly Yang, who also understands the value of a human life. Just finished watching this awesome series and I just cannot get over the immense breadth and scope of the story and the intricacy of its characters. This is a fantastic write up of some of the seminal moments of the series. Buckocks death I have to admit, brought out the man tears. One of my favourite characters together with the immortal Walter von Schenkopp! So I love Legends of the Galactic Heroes, I really do. But there was one flaw that struck me while watching it. Kirchies’ death scene was heartbreaking for me, as I too have lost several friends to untimely ends, and just like Rhinehard, they’re always on my mind, even years later. It’s one of the reasons why I connected so heavily with the story. 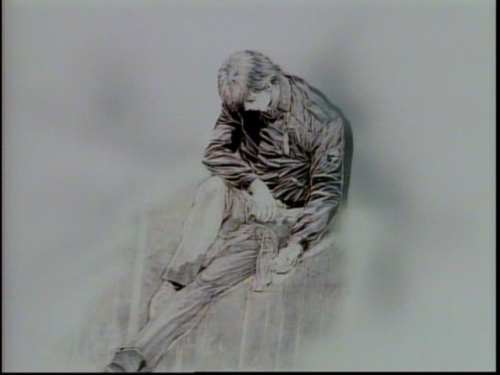 The way Rhinehard hold Kirchies’ hand as he’s dying is such a blow to the gut, I well up with tears everytime I see it. That being said, what the hell was up with that assassination attempt? Ansbach literally pulls out a small space bazooka to try and kill Rhinehard with. How the hell did they even get that thing in Braunschwig’s chest cavity? In hindsight, and considering what happens immediately afterwards, it just seems like a bizarre decision to include that. The first time I saw it, I was laughing at the absurdity of it, then I was crying because Kirchies dies. If I could remake this show I would definitely alter the details of that scene. Ruenthals’ rebellion was an important part of the storyline, and I think there was more going on there from the author’s agenda then we might have picked up on. Sure there’s the human element of Ruenthal’s behavior, but I think what the author was going for was highlighting the inherent weaknesses of autocracy as a form of government. Which is that a government based around one strongman central authority figure can be toppled simply by deposing him and taking command for oneself. Because Rhinehard usurps the throne, and it’s considered legitimate by the majority of the populace of the Empire, then it would just be as legitimate for Ruenthal to usurp the throne from Rhinehard. This, for obvious reasons, is the core reason of why autocracy is not a long term viable form of governance, Yang Wen-li and others comment on this from time to time in the show. It’s not even a year from the death of Yang Wen-li and the fall of the Free Planets Alliance that the victorious Nueu Reich of Lohengramm’s dynasty is already beset by infighting that has the potential to destroy the peace that was just barely won. Ruenthal’s rebellion was vital because it helped to show that the author was in fact, not a fan of autocracy or strong man government. Despite the fact that the author decided to have the Empire win, it shows just why it’s not a good option. Democracy, for all it’s weaknesses, has this idea that authority is only legitimate if it is freely given by the people to the state. For example, with in the story, Rudolf didn’t seize power as an outsider, he used the system to do that. Something as simple the legal oversight of not putting the rule that you can’t hold the office of President and Prime Minister at the same time is what allowed Rudolf to take control of the galactic republic, not military strength. If he had taken over through military conquest instead of political maneuvering, he wouldn’t have been allowed to take over the way he did.